I collect souvenirs, as do many friends and family members. Most of these souvenirs have scant monetary value, but we treasure them as tangible reminders of people, places, or events important in our lives. Rummaging through the museum collections, I found several souvenirs that suggest that some scientists were equally sentimental. This small glass dish has some gunk inside, and a handwritten note: "The mould that makes Penicillin. Alexander Fleming." 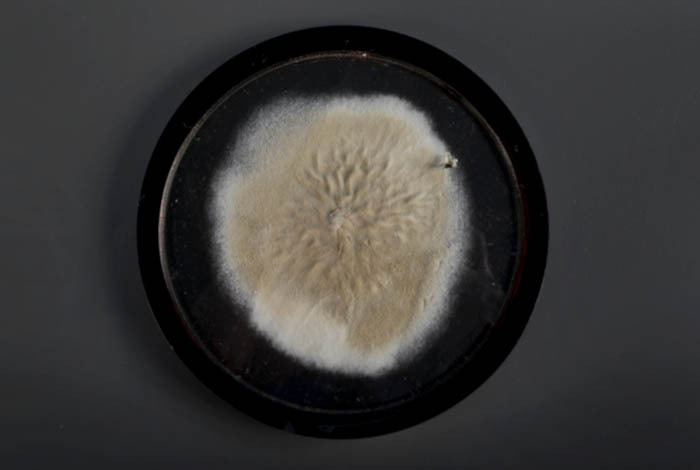 Fleming was a Scottish bacteriologist who, while working in a laboratory in a London hospital in 1928, noticed that a specific fungus—Penicillin B—killed certain bacteria. In the 1930s, Howard Florey (a pharmacologist from Australia) and Ernst Chain (a German-Jewish biochemist), both working at Oxford, succeeded in refining and furthering our understanding of penicillin. With this work in hand, Americans were able to organize a crash program to produce penicillin in quantities sufficient to protect Allied troops serving in World War II. In 1945, Fleming, Florey, and Chain shared the Nobel Prize in Physiology or Medicine. Fleming produced his souvenir samples soon thereafter. He gave two to Dan Stratful, a technician in his laboratory, and Stratful passed one on to Diane Huntingford, a secretary in the department. Years later, Huntington's sample was bought by Pfizer, a major pharmaceutical firm, and given to the Smithsonian. 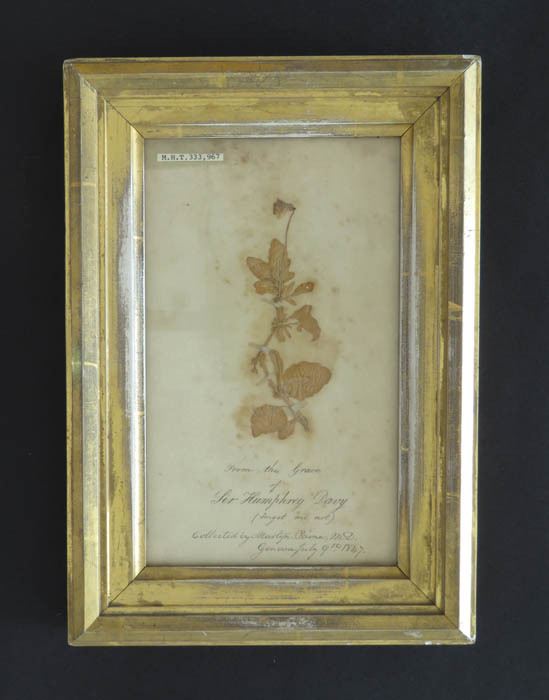 A second scientific souvenir is a pressed flower with the inked inscription: "From the Grave of Sir Humphry Davy (forget me not) collected by Martyn Paine, M.D. Geneva July 9th 1847." Humphry Davy (1778–1829) was the most renowned English scientist of his generation, having discovered several new elements, invented the safety lamp for use in coal mines, and served as president of the Royal Society of London. He died in Geneva, Switzerland, and was buried in the local cemetery, near the grave of John Calvin—facts noted in travel books of the period. Martyn Paine (1794–1877) was a graduate of the Harvard Medical School who taught in the Department of Medicine of the University of the City of New York. He probably gave this souvenir to his colleague, John William Draper, a professor of chemistry and physiology. It came to the museum along with other objects from the Draper family. This piece of silk was dyed by Sir William Henry Perkin in 1860 and presented to William John Matheson on October 8, 1906. This colorful souvenir is historically significant. In 1856, while a student at the Royal College of Chemistry, William Henry Perkin spent his spring vacation in a crude laboratory in the attic of his house in East London. There he discovered that aniline, a colorless aromatic oil derived from coal tar, could be transformed into a black gunk that, when mixed with alcohol, would turn fabrics bright purple. With patent in hand, Perkin established the artificial dye industry. Wealth and honors followed soon thereafter. In 1906, while in New York for a lavish celebration of the 50th anniversary of the coal tar industry, Perkin visited William John Matheson, an American who imported artificial dyes and pigments, and probably gave him this memento at that time. Matheson, in turn, gave it to the Smithsonian. This unassuming artifact is one of curator Deborah Warner's favorite scientific souvenirs in the museum. My favorite scientific souvenir is a nondescript piece of metal wrapped in paper carrying the words: ". . . about 1840 in . . . tripod for the vertical circle used by F.G.W. von Struve in his Russian Gradmessung; used [by] me in 1865–66 as a paper weight in Poulkowa: covered with white paper by Gramadski for my birthday 1865 Dec. 3. Recovered . . . 1887." This inscription refers to Friedrich Georg Wilhelm von Struve, an accomplished German astronomer who in 1839, at the behest of Tsar Nicholas I, moved from his home in Dorpat (now Tartu) to Pulkovo (a town near St. Petersburg), to establish a great Russian national observatory. In this new situation, Struve observed double stars, conducted geodetic surveys of Russia, and prepared his son Otto to follow in his footsteps. Guessing that this souvenir belonged to Cleveland Abbe, a young American who spent two years at Pulkovo, I looked at the Abbe papers at the Library of Congress. 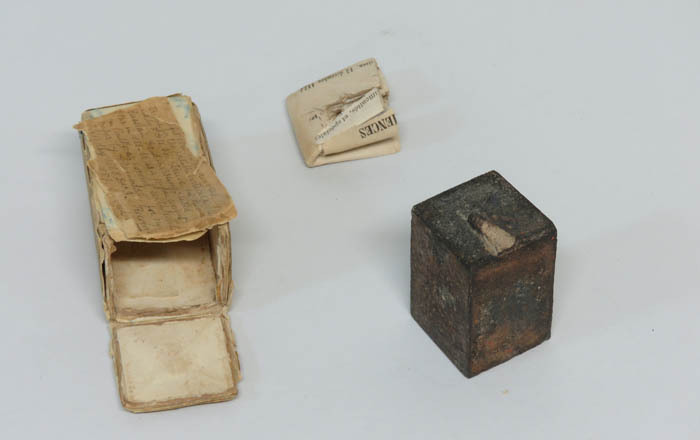 In his diary for 1865, I found two relevant notes: "My 27 Birthday Anniversary" on Dec. 3; and "Gromadski Paper Weight" on Dec. 4. Writing to his mother soon thereafter, Abbe noted that "My pen is a quill from Poland & made for me by my Polish friend Gromadski, who has a very poetical fancy and assures me that no true Pole or true poet can write with the English steel pens. I am inclined to agree with him." Abbe was never able to land a good astronomical job, but he did establish the organization that became the U.S. Weather Bureau. So why should we care about a dish of mold, a dead flower, a scrap of colored cloth, a chunk of metal wrapped in paper, or other detritus of daily life? My answer is that, when we look beyond intrinsic value, we might appreciate the significance that these things had for the people who made and owned them along the way. Deborah Warner is a curator in the Division of Medicine and Science who blogs about science and culture.